Jack’s Angels thinking of JBT. 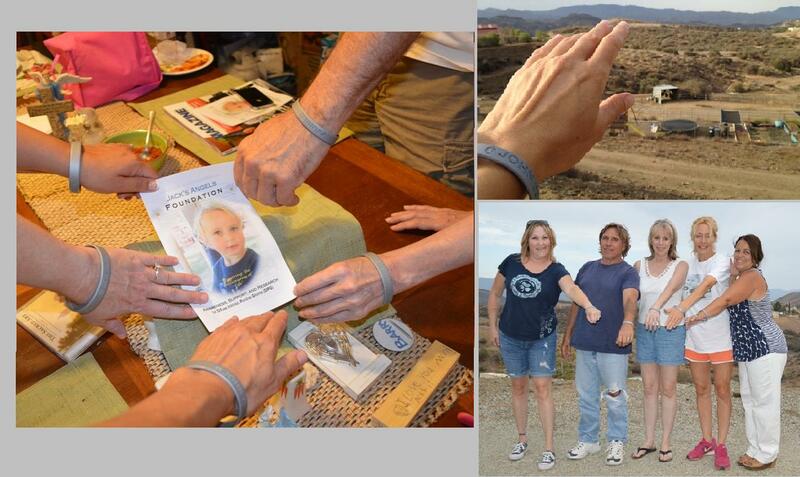 I wanted to send you these pictures from Agua Dulce CA, our home, and also home of Jack’s Angels Foundation for DIPG. Our event planning committee met this week, and although only 5 of us are in the picture, there are 10 of us wearing JBT wristbands. I’m so excited to know you are getting the very best care. We are all praying for your continued success!! We met with your Aunt Kalee, Uncle Dan and cousin Otto the other day. They wanted to meet us and help us here at Jack’s Angels while they are not able to be right there with you. You have an incredibly wonderful family. We are rooting for you all the way!! Hi , Buddy, how is My Super Hero Today? I am sure are very excited about going home soon! Thinking about You and Mommy, Dad, Clara and Elizabeth…..and The entire Super Hero support Group!